THE REAL STORY ON HEARTWORM AND FLEA ISSUES, A MUST READ. Your pets life depends on you! So, now lets say that a mosquito has bitten an infested dog and the temperature has remained above 57ï¿½ F for a minimum of 14 days since that bite and the mosquito bites your dog. Still your dog is not infested because the L3 larva are deposited in a tiny droplet of mosquito saliva adjacent to the bite not actually injected into your dog as many would have us believe. Once it makes this development into the L5 it then leaves the skin and enters the circulatory system. The L5 or young adult then migrates to the heart and pulmonary arteries. Once there it will mate approximately 5 to 7 months after entering the dogs body. That is of course assuming that the dog has been infested with both male and female larva. This mating produces the Microfilariae. is by far the most important part of medicine. As you all know by now, I am convinced that having a very strong immune system is of the utmost importance to your dog. I believe that a strong healthy dog will throw off parasites and illness all on it's own. With that said, dogs that are not at their peak of health should be first started with a good diet, I recommend a raw, species appropriate diet first and foremost. At the very least a home cooked one (or if for some reason you can not do either for your dog, then an organic, chemical free, grain free food), supplementation and general remedies for a period of time to strengthen their immune system. Then, the wonderful, natural treatment effects will kick in! "The objective of treating a dog with heartworm should NOT be to get rid of the heartworm. You're not treating the heartworm, you're treating the dog... It makes a lot more sense to measure the treatment by looking at the dog's quality of life. So, he is positive for heartworm. The fact is, heartworms have been around forever and dogs and heartworms have been coexisting for all eternity. It's actually a relatively recent phenomenon that dogs are dying from heartworm. Heartworm is not, by any means, the death penealy it's made out to be. The dogs that die from heartwom are the dogs that ar being vaccinated, fed commercial food and are being treated with supressive drugs for every little thing that comes along"." I (as well as other veterinary naturopaths and many holistic vets) maintain that, "Allopathic medicine is based on fear - fear of disease, fear of pathogens, fear of death. It's fear-based medicine. 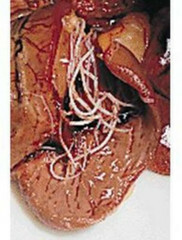 Allopathic/fear based medicine has been the approach that's been used to get people to use heartworm preventives. It is not to say that heartwomrs don't exist, obviously, they do. The very same fear-based approach is used as the main basis of vaccinations and for a lot of things. Disease, illness and symptoms come from within. A relatively healthy animal will not be susceptible to those things. So the ultimate answer is not to prevent heartworm (or distemper or parvo or whatever), by some artifical means, but rather to work on improving and maintaining good health. To the degree that you can imporve your dog's level of health, disease of any kind becomes less threatening." NOW, realize this, a dog must be essentially healthy in order to resist succumbing to heartworm (or its treatments). This statement is more than just an idle observation ï¿½ it is the principle that ensures the survival of wild canines, who (think about this now...) suffer far greater exposure to heartworm-carrying mosquitoes then our domestic pets however, they succumb in far lesser numbers than our domestic dogs! Dr. William Falconer, a veterinarian with a homeopathic practice in Austin, Texas states: ï¿½The heartworm has been out there forever as far as we know, but we donï¿½t read reports of wolves and coyotes being wiped out by heartworm, and yet domestic dogs are falling prey to it." So why are our pets/domesticated dogs falling prey to heartworms? Surely they are more healthy then the wild canines, with all our feeding of "scientifically balanced", processed foods and vaccinating them to prevent them from getting all the nasty and sometimes fatal diseases right? ... WRONG! We are vaccinating our dogs way too much and way too often, weï¿½re feeding them poor nutrition to say the least, and weï¿½re using chemical pesticides to kill their fleas, ticks and any internal parasites they may have. All of these things combine to weaken their immune systems, and their immunity is the only thing that can save them. On the other hand, foxes, coyotes, and wolves go un-vaccinated, eat only raw meat, bones, and a very few herbs and/or berries when there is no meat available. These wild canines are never exposed to the dozens of toxic chemicals we use to kill fleas, ticks and even heartworm on our dogs and in our homes. Interesting that some coyotes and foxes have been found through research, to be able to ï¿½fight offï¿½ heartworm infestations and some others become host to the parasite however, in small enough numbers that the heartworms donï¿½t threaten their hostsï¿½ lives. Whichever end of the scale holistic veterinarians and veterinary naturopaths, place themselves on, we all agree about the first step toward heartworm prevention and treatment: A dog must be essentially healthy in order to resist succumbing to heartworm (or its treatments). This is more than an idle observation ï¿½ it is the principle that ensures the survival of wild canines, who suffer far greater exposure to heartworm-carrying mosquitoes but succumb from the parasites in far lesser numbers than domestic dogs. Parasites were never intended to kill their hosts. It and when they do, then you can be assured that something is very out of balance. A parasiteï¿½s whole evolutionary thrust is to continue to live/survive its life cycle; if it kills its host, then thereï¿½s a dead end. The fact that our dogs are dying of this disease in greater and greater numbers indicates loudly that something is way out of whack! Given the wild caninesï¿½ inate efficiency in dealing with heartworm, virtually all veterinary naturopaths and holistic practitioners, recommend utilizing as many aspects of the wild caninesï¿½ lifestyle as is practical for domestic dogs, including, most importantly, a natural diet of raw meat and bones, minimal vaccination, and severely curtailed exposure to flea/tick -killing pesticides. Just STOP using them! There are many alternative, healthy ways of preventing and even killing pests but again, a healthy immune system is the key. Animals with healthy, balanced immune systems are not in need of any specific preventives becuase their very lifestyle is their preventative! As stated above, the best prevention is a healthy lifestyle with the elimination of over vaccinating and chemicals as well as raw meaty bone diet. Please, understand, when your dog is on Heartworm pills or chews (all pesticides), mosquitoes will still be attracted to your dog and will still bite them. The key is to get the blood of your pet in a healthy enough condition that the mosquitoes won't want it. Healthy dogs actually have a bitter tasting blood to parasites. Un-healthy dog's blood is more attracitve them and may taste sweet to them. Were you aware that dogs and cats have their own way of protecting themselves from mosquitoes? They instinctively will avoid the hot, muggy places where mosquitoes congregate and spend time in the cool, dry areas. You may also notice them roll in the dust or even mud to remove moisture from the skin and change their scent,to be less attractive to mosquitoes. Again, I stress, prevention of any dis-ease comes from proper, species appropriate nutrition. With proper carnivore nutriton, they will develop and maintain a strong immune system. It is pretty rare for worms to kill dogs. They will die eventually when their environment is not conducive to their own life and perpetuation. However, remember if your dog has a low immune system, the parasites they may be host to are more likely to reproduce and take over with infestation. Proper nutrition is the foundation for thriving health. Proper nutrition for a carnivore is raw meat, bones and organs. While a home cooked diet is better then kibble or canned, processed foods, it is still lacking in the live enzymes, amino acids, etc. needed for perfect health. If you are interested in learning how to feed your dog a raw diet and just beginning your homework and reseach, please consider using a freeze dried or dehydrated raw diet in the mean time. At the very least, feed them a diet layerd with dehydrated raw contaiing NO grains or potatoes so they are getting SOME live, vital nutrients. There are several great Natural Preventative Programs out there. However, PLEASE Remember, the key is to keep your dogs healthy with a strong immune system; not to rely on herbs or other modalities while still feeding junk food, vaccinating and using chemicals on your pets. Transfer Factors (found in Bovine Colostrum) and Humic extracts, specifically Fulvic acids. Colostrum contains tiny fragments of molecules, possibly DNA fragments, that somehow remain functional. These fragments seem to be energized with some unknown mysterious power of self-replicating communication. Interestingly, in many ways the scientific studies on the mysteries and mechanisms of fulvic acid parallel exactly the studies on Colostrum and transfer factors. So far as we know, no other scientists have actually put the two together. Scientists working with fulvic acid know that it also is an ultramicroscopic substance that has a most unique messaging relay system that is activated when it comes into contact with living organisms. Just like transfer factors in colostrum, fulvic acid sensitizes cells, passing on unique information related to immunity. It also has been shown to assist in activating protection and defense mechanisms that are able to be passed on and remain with the organism for life, even with just one contact. As a preventitive, many people are using Vital HFï¿½ which is a Humic Acid/Fulvic Acid product. There are Essential Oils that when in their pure, therapeutic form (such as Young Living Essential Oils) that are wonderful mosquito deterants for both pets and people! I personally make up and use a mist/spray made of 1 cup of distilled water with 10 drops of geranium OR 4 drops each of lemongrass, grapefruit and peppermint. Shake before spraying. I use this on myself as well as the dogs as a great mosquito and bug repellant when I am out in the garden in the evening. Nice and safe with no worries of toxic chemicals on the skin. There a many essential oils that make very effective and safe insect deterants, you may want to try some different combinations for yourself and dogs to see what works best for you. Again, PLEASE NOTE! ONLY Young Living Essential Oils are recommened or used by the Whole Dog as we know these oils to be 100% pure, organic and theraputic grade. I do not recommend people take thier dogs off their heartworm medications unless they agree to do so with their holistic vet or veterinary naturopath's supervision. Copyright ï¿½ 2003 -2009 This article is the sole property of Jeanette (Jeannie) Thomason and The Whole Dog. It cannot be reproduced in any form whatsoever without the expressed written consent of the author. As Spring comes on and the warmer weather creeps up, many of us start to worry about those tough, relentless little survivors we call fleas. When your dog (or cat)is not around, they will even eat each other to survive and wait for your dog to become it’s new host! These little parasites spend most of their time in their surroundings instead of the actual host (in places like your carpets, covers and any hidden crack). This is why just treating your dog will never work in battle against fleas. You must treat the surrounding environment as well as your pet, all of which can become a hard and long fight. Jeffrey Levy, DVM - "Have you ever wondered why some dogs and cats have severe flea problems, while others are hardly bothered by the little pests? Fleas can be viewed as an indicator of an animal's general health. Parasites in general, and fleas in particular, are most attracted to the weak, unhealthy, or very young animal whose immune system is not functioning well. The long-term solution to a flea problem is to reduce your pet's susceptibility to fleas by improving his/her health." In the conventional animal health industry, the fact that parasites (worms, heartworm, fleas, ticks, flies, giardia) will attach themselves to a sick animal before they will attach to a healthy animal, is hardly ever made known to the pet loving public however, I want you to know the facts. People that have dogs or cats with fleas, skin problems, allergies, digestive problems and behavioral problems spend hundreds of dollars at the veterinarian on flea prevention, antibiotics, steroids, tranquilizers, and other medication. The sad but all too truthful fact is that antibiotics, steroids, and many other medications take a serious toll on the pet's internal organs and immune systems. The animal's problems become a never-ending circle of medication and sickness. Skin problems, allergies and flea infestations are in reality, just the obvious outward signs/symptoms of a nutritional deficiency and toxic overload. We are all bombarded with advertising to prevent parasites/pests (fleas, ticks, heartworms, intestinal worms) with toxic, lethal chemicals of all types and strengths for all sizes and breeds of dogs or cats. More then likely, you have been using some of these chemicals that your veterinarian has prescribed and sold to you. You may even be one of the increasingly many that have even seen your dog go into an epileptic seizure almost immediately upon being administered one of the lethal chemicals sold to the unsuspecting public to "protect" their cherished little companion. Are you aware that there are some breeds of dogs that are actually killed when these chemical products are administered to them? You may be using these chemicals and maybe you are even troubled about it because your pet's health has taken a turn for the worse. You aren't sure why, but if you look back at what you have been using on your (or in your) pet to "prevent" fleas, ticks or heartworm, you might realize that your dog's health began to decline some time after a foreign matter was applied to your dog's body or ingested. Be it a vaccination or be it a chemical to kill worms, ticks, fleas or protozoa, any time a chemical or something foreign to an animal is put into its body, there WILL be a reaction. Most of the time the reaction will happen internally and you may not be aware at the time of how detrimental this foreign matter is. Imagine how extremely lethal a chemical has to be if it is administered only once a month or once a season or the label says not allow the pet to come into contact with your children or bedding! Common Sense should tell us that if it is so dangerous that you have to wear gloves to administer it, must keep the pet AWAY from children or bedding that it has to be "bad news" not only for the fleas and ticks but to your poor dog whose blood stream these chemicals are now moving through. Did you know that your dog's liver and kidneys are adversely affected by the use of flea collars, Topical drops, chemical de-wormers, heart worm drugs? instability in walking and many more. The toxic chemicals can, over time result in renal failure (kidney failure)and/or liver damage to the point of the liver becoming unable to filter the blood and in many cases, complete liver failure. Contaminated blood circulating throughout the body day after day will most definitely contribute to other more complicated health issues, such as diabetes and arthritis to name just two of the most common long term side effects. The side effects from these toxic chemicals are so bad that in many cases, pets can actually die within days of receiving these lethal doses of chemicals prescribed to kill a little bitty parasite. Does your pet need to be poisoned just to kill a little parasite that could be prevented or removed without any of these dangerous side effects listed above? Especially when it is a known fact that there are a whole variety of God given remedies in nature; that were placed on this Earth by the Creator to keep His little creatures free of parasites if only "man" was intelligent enough to discover them? Still people continue to use these drugs because they don't know there is a better, simpler, less expensive, SAFER way. There are safe effective alternatives for your dog! You can do it all without chemicals! Slowly, more veterinarians (especially holstic vets) are beginning to be more aware of the role nutrition plays in health and are beginning to recommend to their clients a raw diet or a home prepared one with supplements. At the very least, some are recommending that owners begin to supplement their pets still on a processed pet food diet, by giving them a daily dose of Salmon oil, probiotcs and other nutrients for optimum health and vitality. The food your pets eat should provide all of the nutritional components which are necessary for all organs and systems of a healthy body to perform in harmonious unison. A properly functioning body does an amazing job at preventing disease and healing itself, and to do this it requires the energies and nutrients of a species appropriate diet. In terms of finding the proper diet for our companions, this means learning to look beyond our own needs, opinions, and agendas to address the natural needs of the animals that we are responsible for. Flea problems do not stem from the presence of fleas, but from health related and environmental circumstances which enable to fleas to thrive and reproduce. They are opportunists, preying on the weak and unhealthy whose immune system is not balanced and functioning at full capacity (so to speak). Dry flaky skin, constant shedding, scratching, chewing on its self reveals a general susceptibility in the animal's immune system which in turn, provides the perfect environment for parasites. If your dog is unhealthy, suffering from poor circulation, poor digestion, over-vaccination or food allergies, his ability to deal with and fight off fleas are decreased. A healthy dog eating a fresh, species specific diet with a strong immune system will not be bothered by these pests. One of the first things I recommend is researching and switching your dog (or cat)to a raw diet. (if you have an older or ill animal, a consultation is highly recommended). If a raw diet is not something you are still not willing to do at this time, then a home cooked diet with supplements is so much more healthy then feeding a processed, grain and carbohydrate loaded pet food. If cooking for your dog is also totally out of the question for some reason then there are only a very few foods I can recommend. Providing a fresh, grain free diet and proper supplementation will surely help your dog and avoid future flea infestations. Probiotics and digestive enzymes are highly recommended for flea sufferers. By assisting the transport of nutrients through the body and aiding in the breakdown and removal of waste products, probiotics and digestive-enzymes help alleviate the food-allergy problems found in many commercially fed dogs with flea problems and help boost the immune system. Organic apple cider vinegar added to your pets water can also help. In some cases, B-complex vitamins, trace minerals and zinc added to your pet's meal are very beneficial. (check with your Veterinary Naturopath, Animal Nutritionist or Holistic Veterinarian for dosages). Burdock root, dandelion root and red clover are great blood cleansers and naturally eliminate waste which help the immune system fight the flea bites. A low-alcohol tincture is best, squirted directly into your pets mouth or added to it’s water. Bovine Colostrum is an all natural substance that contains transfer factors that work by "teaching" your pets (or your own) immune system to identify infectious agents that attack your body every day. To keep a body healthy, the immune system must do three very important things each time it comes in contact with a pathogen: First it must first recognize the pathogen as a threat to the body; second, it must then attack and kill off the threat; and third, it must remember that pathogen so that your body can rid itself quickly of it the next time it is attacked. Plants produce essential oils as their own survival technique to repel bugs This makes essential oils great insect repellents for animals (and humans, too). Essential oils are all natural, mild and will leave your dog’s coat healthy and vibrant. For centuries, EO's have been used in a variety of ways to repel fleas, ticks and other biting insects. These oils are nature's own God given repellants. They ward off unwanted hitchhikers. Some of the more common oils that act as flea and insect repellants are citronella, cedar, eucalyptus, lemongrass, peppermint and lavender. Essential oils are naturally designed to repel fleas and ticks without using potentially dangerous pesticides found in common insect repellents. Essential oil formulations do need to be applied more frequently than synthetic pesticides, but the benefits far outweigh the exposure to harsh chemical smells and toxic side effects. They are great for misting your dog's legs (and your own) any time that you go out where fleas would be likely to be found. NOTE I only recommend using Young Living Essential oils as they are scientifically tested to assure thier purity. For severe itching and inflamed or red spots from flea bites, the herbs, licorice or yucca are both great as an anti-inflammatory aids. A calendula flower or fresh rosemary rinse as well as aloe juice will promote healing and help fight the itching. CAUTION Some Essential Oils are not well tolerated by cats. Please only use 100% pure, grade A essential oils (Young Living) and only in very small diluted amounts with the supervision of your holistic Vet or Aromatherapist with cats. Remember the flea spends 80% of his time in the surrounding environment, not on your dog or cat. Treat the area with products containing Young Living oils of juniper, cedar, eucalyptus, Canadian fleabane, lavender, lemongrass or citric oil. Canadian flea bane and citrus oil contain d-Limonene which kills fleas. In certain sections of the United States and other parts of the world,there are glacial deposits that consist of diatoms that were prehistoric one-celled animals. When these diatoms are mined and ground into a fine powder, organic farmers have used this gift of Nature to eliminate lice, worms of all sorts [including heart worms], mites, ants, spiders and other parasites from their chickens, ducks, pigeons, dogs, cattle, horses, goats and all their other farm animals as long as the powder has been available to them. Diatoms are one celled microscopic algae whose walls consist of two parts and contain a mineral called silica. Under a very strong microscope, diatoms have very sharp edges. When a flea, ant, spider, etc comes into contact with the remaining sharp edges of the diatoms, they lacerate the waxy exoskeleton of the bug and the powder DE (diatomaceous earth) absorbs the body fluids causing death by dehydration. These sharp edges do not harm animals or humans. When given internally it will ingested by any intestinal worms and it will cut the insides of the worm and it will die. So this is a great natural womer as well. Not to mention you are giving your dogs trace minerals to boot! DE or Diatoms are approximately 3% magnesium, 85% silicon, 5% sodium, 2% iron and many other trace minerals such as titanium, boron, manganese, copper and zirconium. So, at last, there is something a lot more healthy and beneficial that you can do for your dog to eliminate parasites. You can draw upon God's own pantry in nature and provide your beloved companion what the Creator has provided for centuries. Organic farmers have been using natural remedies such as Distoms/Diatomacous Earth to get rid of parasites for their pets and their livestock for years. Eliminating the little, nutrition stealing parasites inside and outside of your dogs and other pets is critical for the health and well being of your animals. Remember, fleas are a symptom. The key to dealing with parasites is to make your animal undesirable to them, and to take steps to prevent an infestation. A healthy dog (or cat) should not be troubled by an occasional flea. Again, there is no substitute for excellent wholesome nutrition, so make sure the nutrition is going to your animals, not the parasites. Your Dog having a healthy immune system also applies to prevention of Heartworms. Copyright © 2006 - 2009 The Whole Dog, Whole Dog News Blog, Whole Dog Forums, Dr Jeannie Thomason, All rights reserved. No part of this article may be reproduced in any form without the written consent of the Author/Publisher. All the articles at The Whole Dog.org. This article is intended to be educational. However, it is not intended to be a substitute for diagnosis or treatment from a veterinarian or other qualified canine health professional. Dr Jeanette (Jeannie) Thomason, The Whole Dog, Whole Dog News, does not assume any legal responsibility.